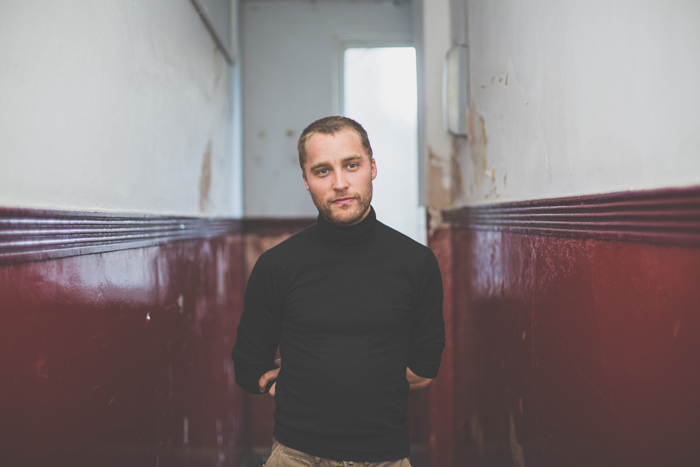 27-year-old Edinburgh-born singer/songwriter Adam Holmes is one of the brightest rising stars on the UK roots music scene, with influences from either side of the Atlantic mixing traditional and contemporary folk with his own brand of soul and Americana. Twice nominated for BBC Radio 2 Folk Awards, his first two albums were also nominated for Scottish Album of the Year in 2014 and 2017, and there is much anticipation as to whether he can make it three in a row this year with third album Midnight Milk, which was released in September 2017. His first album, Heirs and Graces, was produced by John Wood (producer of all Nick Drake’s albums and John Martyn’s iconic Solid Air album) and mastered by Simon Heyworth (co-producer of Mike Oldfield’s Tubular Bells) and second album, Brighter Still, features two-time BRIT award winner Eddi Reader on backing vocals throughout. Latest album Midnight Milk was recorded in one room in his Edinburgh flat, but came complete with full brass section, an eighteen voice choir and a widescreen folk/soul/electronica production, which was influenced by a 2016 collaboration he was involved in with Adrian Utley of Portishead, Dominic Aitchison of Mogwai and Martin Green of Lau. Live, he and his band the Embers combine the rhythm and blues, country and folk music textures of classic artists such as The Band, Tom Petty and The Heartbeakers and Ryan Adams and The Cardinals with their own hint of Scotland. They have featured widely on live sessions for BBC Radio 2 and Radio 3, BBC Scotland, Edith Bowman’s BBC Scotland Quay Sessions show and Virgin Radio, amongst many others, and are regulars on the UK and European festival and touring circuit, having shared bills with the likes of Laura Marling, Van Morrison, Richard Thompson, Jason Isbell, The Avett Brothers, Sturgill Simpson and Chvrches amongst many others. The​ ​three​ ​sisters​ ​can’t​ ​recall​ ​when​ ​or​ ​why​ ​they​ ​started​ ​playing,​ ​the​ ​music’s​ ​always​ ​just​ ​been there.​ ​In​ ​their​ ​late​ ​teens,​ ​the​ ​sisters​ ​joined​ ​forces​ ​with​ ​their​ ​dad,​ ​who​ ​for​ ​decades​ ​was​ ​a one​ ​man​ ​band​ ​playing​ ​old​ ​blues​ ​and​ ​country​ ​tunes​ ​for​ ​a​ ​living. This​ ​foundation​ ​of​ ​classic​ ​”roots​ ​music​ ​and​ ​Americana”​ ​settled​ ​in​ ​their​ ​hearts,​ ​but​ ​also awoke​ ​the​ ​urge​ ​of​ ​breaking​ ​the​ ​rules​ ​of​ ​traditional​ ​music.​ ​Baskery​ ​is​ ​a​ ​band​ ​built​ ​on​ ​what three​ ​people​ ​can​ ​do​ ​together​ ​and​ ​it’s​ ​all​ ​about​ ​turning​ ​the​ ​music​ ​on​ ​its​ ​head,​ ​blending​ ​the straightforwardness​ ​of​ ​punk​ ​with​ ​the​ ​subtlety​ ​of​ ​singer/​ ​songwriting. The​ ​first​ ​album,​ ​”Fall​ ​Among​ ​Thieves”​ ​(2008)​ ​was​ ​recorded​ ​in​ ​Stockholm,​ ​co-produced​ ​by Lasse​ ​Mårtén​​ ​(Pink,​ ​’Peter,​ ​Bjorn​ ​and​ ​John’,​ ​Kelly​ ​Clarkson).​ ​”New​ ​Friends”​ ​(2011)​ ​the follow​ ​up,​ ​the​ ​band​ ​referred​ ​to​ ​it​ ​as​ ​the​ ​”gypsy​ ​album”​ ​since​ ​it​ ​was​ ​mainly​ ​tracked​ ​on​ ​the road​ ​in​ ​various​ ​hotel​ ​rooms​ ​and​ ​band​ ​apartments,​ ​then​ ​mixed​ ​in​ ​Berlin​ ​by​ ​​Blackpete (Depeche​ ​Mode,​ ​Joe​ ​Jackson,​ ​Peter​ ​Fox).​ ​As​ ​a​ ​contrast​ ​to​ ​the​ ​first​ ​two​ ​albums​ ​which​ ​took several​ ​months​ ​to​ ​make,​ ​the​ ​third​ ​one​ ​”Little​ ​Wild​ ​Life”​ ​(2013)​ ​was​ ​recorded​ ​during​ ​ten days​ ​in​ ​an​ ​old​ ​dance​ ​studio​ ​converted​ ​to​ ​a​ ​studio​ ​in​ ​former​ ​east​ ​Berlin,​ ​co-produced​ ​by Matt​ ​Wignall​​ ​(Cold​ ​War​ ​Kids,​ ​J.​ ​Roddy​ ​Walston). All​ ​three​ ​albums​ ​received​ ​great​ ​acclaim​ ​by​ ​the​ ​press​ ​and​ ​are​ ​released​ ​in​ ​numerous countries.​ ​The​ ​releases​ ​in​ ​combination​ ​with​ ​relentless​ ​touring​ ​have​ ​given​ ​the​ ​band​ ​a reputation​ ​as​ ​one​ ​of​ ​the​ ​music​ ​scene’s​ ​most​ ​noticeable​ ​live​ ​acts. In​ ​2012​ ​the​ ​Bondesson​ ​sisters​ ​founded​ ​their​ ​own​ ​production​ ​and​ ​publishing​ ​company, Mother​ ​Tarantula​ ​/​ ​Spiderling​​ ​and​ ​have​ ​produced​ ​and​ ​released​ ​two​ ​albums​ ​and​ ​one​ ​live DVD.​ ​Their​ ​projects​ ​are​ ​supported​ ​by​ ​the​ ​Swedish​ ​art​ ​council​ ​which​ ​aim​ ​is​ ​to​ ​preserve unique​ ​art​ ​and​ ​music.​ ​In​ ​both​ ​2011​ ​and​ ​2013​ ​the​ ​sisters​ ​received​ ​individual​ ​awards​ ​for​ ​their songwriting​ ​skills​ ​by​ ​Swedish​ ​composer’s​ ​society​ ​​STIM​. In​ ​early​ ​2014​ ​the​ ​band​ ​started​ ​working​ ​with​ K​​obalt​ ​Music​ ​Publishing​​ ​and​ ​have​ ​recently collaborated​ ​with​ ​high-profile​ ​songwriters​ ​such​ ​as​ ​​Billy​ ​Steinberg​​ ​(Madonna,​ ​The​ ​Bangles, (Cyndi​ ​Lauper),​ ​​Joe​ ​Henry​ ​​(John​ ​Denver)​ ​and​ J​​immy​ ​Harry​ ​​(Madonna,​ ​Pink,​ ​Kelly Clarkson,​ ​Britney​ ​Spears). Since​ ​the​ ​very​ ​beginning​ ​of​ ​Baskery​ ​the​ ​sisters​ ​have​ ​guarded​ ​their​ ​independence​ ​but​ ​when approached​ ​by​​ ​Dan​ ​McCarroll​​ ​(President​ ​and​ ​A&R)​ ​at​ ​​Warner​ ​Music​,​ ​they​ ​felt​ ​intrigued​ ​to break​ ​their​ ​indie​ ​tradition​ ​and​ ​make​ ​their​ ​next​ ​record​ ​on​ ​a​ ​major​ ​label.​ ​In​ ​August​ ​2014​ ​they signed​ ​a​ ​world​ ​wide​ ​recording​ ​deal​ ​with​ ​Warner​ ​Bros​ ​Music​ ​(Los​ ​Angeles).​ ​Baskery​ ​is​ ​one​ ​of few​ ​Swedish​ ​acts​ ​to​ ​get​ ​signed​ ​directly​ ​to​ ​a​ ​US​ ​major​ ​record​ ​company. Baskery​ ​has​ ​successfully​ ​toured​ ​all​ ​over​ ​the​ ​world,​ ​performing​ ​at​ ​festivals​ ​such​ ​as Glastonbury​​,​ ​​Shrewsbury​ ​Folk​ ​Festival​​,​ ​​SXSW​​ ​(US),​ ​​Colours​ ​of​ ​Ostrava (CZ),​ ​​Portland​ ​Waterfront​ ​Blues​ ​Festival​​ ​(US),​ ​​California​ ​World​ ​Fest​​ ​(US),​ ​​Four Corners​ ​Folk​ ​Festival​,​ ​(US),​ ​​Winnipeg​ ​Folk​ ​Festival​ (​​ CA),​ ​​Calgary​ ​Folk​ ​Festival​ ​​(CA), Woodford​ ​Folk​ ​Festival​ ​​(AUS),​ ​​Peace​ ​and​ ​Love​​ ​(SE),​ ​​Storsjöyran​​ ​(SWE),​ ​​Lowlands (NL),​ ​​Azkena​ ​Rock​​ ​(ES),​​ ​Bergen​ ​Fest​ ​​(NOR),​ ​​Toender​​ ​(DK). In​ ​2015​ ​the​ ​band​ ​toured​ ​in​ ​Europe​ ​and​ ​North​ ​America,​ ​performing​ ​with​ ​legendary​ ​artist Robbie​ ​Williams​.​ ​The​ ​girls​ ​have​ ​toured​ ​with​ ​​Gary​ ​Clark​ ​Jr​,​ ​and​ ​​Brandi​ ​Carlile​​ ​,​ ​earning critical​ ​acclaim​ ​from​ ​​Q​ ​magazine​,​ ​​Mojo​ ​magazine,​ ​ ​​Uncut​ ​magazine​,​ ​and​ ​many​ ​more. The​ ​band​ ​will​ ​continue​ ​to​ ​tour​ ​throughout​ ​the​ ​end​ ​of​ ​2016​ ​through​ ​2017,​ ​dotting​ ​Europe and​ ​North​ ​America​ ​with​ ​performances​ ​of​ ​their​ ​already​ ​legacy-laden​ ​career. like​ ​Tom​ ​Petty​ ​&​ ​the​ ​Heartbreakers,​ ​Red​ ​Hot​ ​Chili​ ​Peppers,​ ​Alabama​ ​Shakes,​ ​Dr​ ​John, Mumford​ ​and​ ​Sons,​ ​The​ ​Meters,​ ​The​ ​Avett​ ​Brothers​ ​and​ ​more.​ ​They​ ​were​ ​invited​ ​to​ ​perform at​ ​the​ ​renowned​ ​live​ ​radio​ ​show​ ​Etown​ ​in​ ​Boulder,​ ​sharing​ ​the​ ​bill​ ​with​ ​Fruition​ ​out​ ​of Portland.​ ​New​ ​music​ ​was​ ​recorded​ ​at​ ​their​ ​longtime​ ​friend​ ​Ray​ ​Kennedy’s​ ​studio​ ​in Nashville,​ ​where​ ​they​ ​plan​ t​o​ ​return​ ​in​ ​2018.